Have you ever tried walking your dogs to the park with a zig-zag routine or walking your dog who is much stronger than you? If yes, then you would know that a simple collar or simple leash is not enough. For this kind of situation, a dog harness may be your best option. Safety is one of the most important reasons why people invest on dog harness. Comfort and obedience training will follow. As a pet owner, it is your primary responsibility to keep your dogs, particularly Goldendoodles, to have plenty of exercises since they are active breeds. One of the most common questions pet owners ask is whether to use a harness or a collar. While collars may work well, the use of harness can offer more important benefits to dogs. 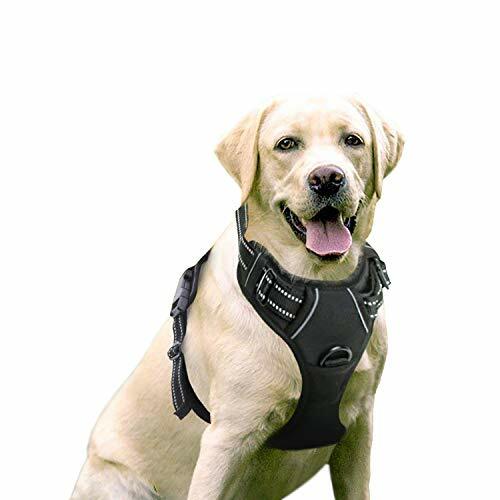 Harness provides added security and support which can improve control over the pet. When it comes to choosing the right harness, there are several things you need to consider. There are several types of harness and different fits. It is important to measure your dog’s ribcage before buying a harness in order to check the packaging to ensure proper choosing of size. Harness that is too tight can be painful to dogs and too loose harness can wiggle out. For medium to large size dogs, you would want to have a harness that is made of the highest quality that can ensure durability for long-lasting use. Dogs must feel comfortable when they use a harness. It must not provide pressure on the throat and neck. A harness is a good investment if you are a pet owner. That is why you should never bargain for the price especially when it comes to the safety of your dogs. The Chai’s Adventure Dog Harness is made of scratch-resistant oxford material on its outer layer. It has a Duraflex buckle with maximum loading capacity. The Chai’s dog harness can be easily put on and take off making it convenient to use. It comes in lightweight mesh lining with soft padding in the chest and belly, making it comfortable to use for pet owners. It comes with adjustable straps that can be altered for custom fit. This product also comes in 3M reflective materials best for great visibility at night. It also has a sturdy seat belt that can be used when riding a car. This Outdoor Adventure Harness is a high-quality harness for everyday use. It can be easily fit, very comfortable, and durable. This harness can eliminate the pressure from the dog’s neck and prevents possible spine, neck, or windpipe injuries. 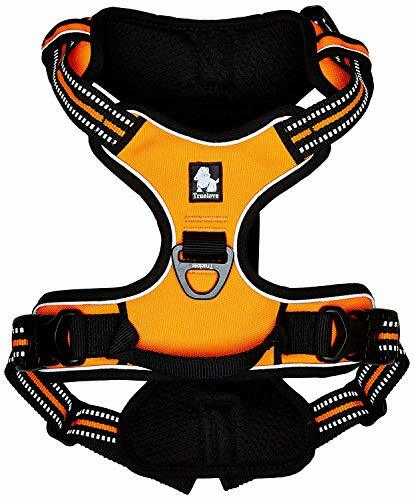 The Chai’s Outdoor Dog Harness can also be a great choice for handicapped or injured dogs. The harness can offer maximum support and control when the dog is walking, climbing the stairs, or even running. The Blueberry Multi-Colored Collection Harness is made of soft, and lightweight mesh, polyester and oxford materials. It comes with eco-friendly plastic buckles. The Blueberry Harness also has reflective stripes which can be used for safety in the dark. The Blueberry Harness is a stylish harness with 3M multi-colored stripes which has a reflective feature that can provide visibility and safety especially during night walks and outdoor runs. This harness is made of quality materials yet lightweight which can give ultimate comfort for your dogs. It is designed as a dual-vest design which can help distribute and balance the weight against strong pulling. 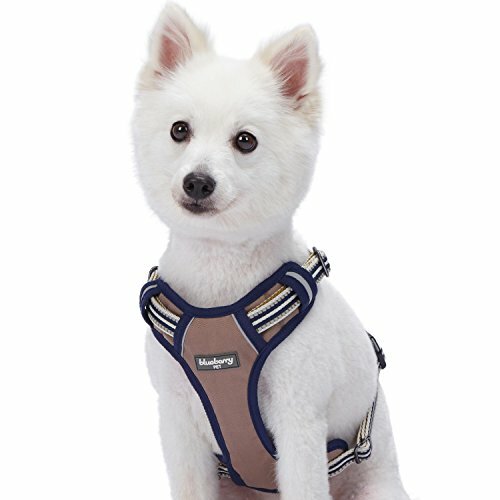 This padded dog harness is composed of lightweight mesh, oxford materials, and polyester for maximum comfort. It comes with an adjustable neck and chest straps which can be altered to give a custom fit for your dogs. The Rabbitgoo Dog Harness is an easy-on-easy-off harness for dogs. Its pulling pressure is equally distributed to the Goldendoodle’s body which prevents choking and pulling. It comes with adjustable slide straps that can be customized according to the unique fit. It also has two metal leash attachment on the chest and on the back. In addition, the Rabbitgoo Harness also comes with reflective straps that can ensure safety for your pets especially when going for a walk outdoor. The harness is made of sturdy yet breathable materials which include heavy padding to give utmost comfort for your dogs by providing a snug fit around the body. This harness offers a no-pull feature which enables you to fully control your dog by putting the leash to the front clip. So every time that your dog pulls, he or she will be turned around instead of going forward. Whether you are a dog parent or a seasoned pet trainer who wants to make a better walk with pets, finding the best dog harness can be a little bit puzzling. A dog harness is an important investment especially if you are a pet owner. For Goldendoodles, it is important to choose a harness that can provide security and safety since this particular type of dog is one of the most energetic breeds in the world of pets. When you decide to buy a dog harness, you must consider the durability, cost, and style. Whatever the breed of your dog is, there is a unique harness that can suit them perfectly. Thorough research is a must if you want to have a good quality harness to your favorite Goldendoodle. Make sure to groom your Goldendoodle daily and get yourself a good brush here. Also, make sure to get a high quality shampoo for your Goldendoodle.